Tokyo: A cooing, gesturing humanoid on wheels that can decipher emotions has been unveiled in Japan by billionaire Masayoshi Son who says robots should be tender and make people smile. 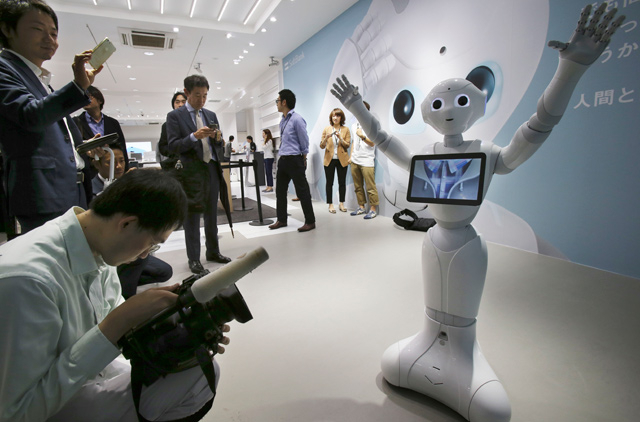 Son’s mobile phone company Softbank said Thursday that the robot it has dubbed Pepper will go on sale in Japan in February for 198,000 yen ($1,900). Overseas sales plans are under consideration but undecided. The 121 centimetre tall, 28 kilogram white Pepper, which has no hair but two large doll-like eyes and a flat-panel display stuck on its chest, was developed jointly with Aldebaran Robotics, which produces autonomous humanoid robots. In Thursday’s demonstration, Pepper sang, “I want to be loved,” and it did more singing and gesturing with its hands Friday. Sony Corp discontinued the Aibo pet-dog robot in 2006, despite an outcry from its fans. Honda Motor Co. has developed the walking, talking Asimo robot, which appears in Honda showrooms and gala events. Many other Japanese companies, including Hitachi Ltd and Toyota Motor Corp., have developed various robots. There is little emphasis on delivering on practical work, in contrast to industrial robots at factories and military robots for war. But the potential is great for intelligent machines as the number of elderly requiring care is expected to soar in rapidly-aging Japan. Robotic technology is already used to check on the elderly and robots might also play a role in reducing feelings of loneliness and isolation. Softbank, which owns Sprint of the US, boasts more than 100 million subscribers globally. Aldebaran Robotics, which has offices in France, China, Japan and the US, is 78.5 percent owned by Softbank. “I’ve believed that the most important role of robots will be as kind and emotional companions to enhance our daily lives, to bring happiness, constantly surprise us and make people grow,” said Bruno Maisonnier, founder and chief executive of Aldebaran, who appeared on the stage with Son. Pepper can get information from cloud-based databases and comes with safety features to avoid crashes and falls, and its capabilities can grow by installing more robot applications, according to Softbank.